Featherstone Rovers boss John Duffy believes playing the Betfred Championship Shield on their home ground is a reward for the loyalty shown by the club’s fans in a difficult year. 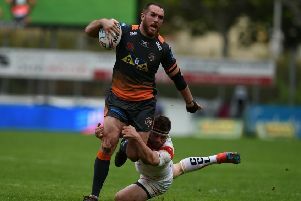 While it has been disappointing for the club not to reach the Super 8s Qualifiers they can at least bow out with a final at the LD Nutrition Stadium having earned the right to stage the game by finishing on top of the Shield league standings. After Rovers beat Swinton last Sunday and Leigh lost to Batley it was confirmed that the final against the Centurions will take place at the Post Office Road ground on Sunday, October 7 (kick-off 3pm). “We said all along it (home advantage in the final) is important for our fans,” said Rovers head coach Duffy. “They have followed us across the world, to France and Canada and that means a lot to me and the players. Duffy is hoping he can have 17 fit players for the final after injuries bit again last weekend, leaving him with only 16 for the match at Swinton. But prospects do not look much rosier as Fev complete their league campaign at home to Barrow Raiders this Sunday. “We came through the game with no new injuries, but Keal Carlile has been struggling with his knee and ankle for quite a while now,” explained Duffy. “Brad Knowles (unused substitute at Swinton) has got a bad knee injury and I’m not sure he’ll play any minutes in the two games we’ve got left. “Harry Newman couldn’t play as he was in the Academy Grand Final and that left us with what we had. It was backs to the wall, but I’m glad we got the two points. “It’s massively important we don’t get any more injuries in this week’s game. I’ve been nervous for a few weeks now with the injuries we have, it’s not been our year for that. Duffy praised several of his players for their efforts in last Sunday’s win. He said: “Sam Brooks played 80 minutes in the middle and was outstanding and Matty Wildie was great when he went to nine. On the match with Swinton, Duffy added: “I thought we were poor in the first half, but Swinton frustrated us real well. I didn’t think it was helped the way it was refereed. Tickets for the Shield final, priced adults £20, concessions £15, juniors £5 are available from today (Thursday) online at www.featherstonerovers.co.uk or from 01977 702386 during normal office hours and the Rovers Superstore.